FINAL SALE. This lace dress has a fun laid-back vibe to it. The Open Lace Flowy Dress is fully lined, except at the waistband, which is semi-sheer. It has a sweetheart neckline, empire waist, and a flowy cut. This dress is made of a unique lace with a circular pattern throughout. A panel of semi-sheer crochet lace at the waist adds a flirty touch. Adjustable spaghetti straps allow you to control the fit and a hidden back zipper completes this look. 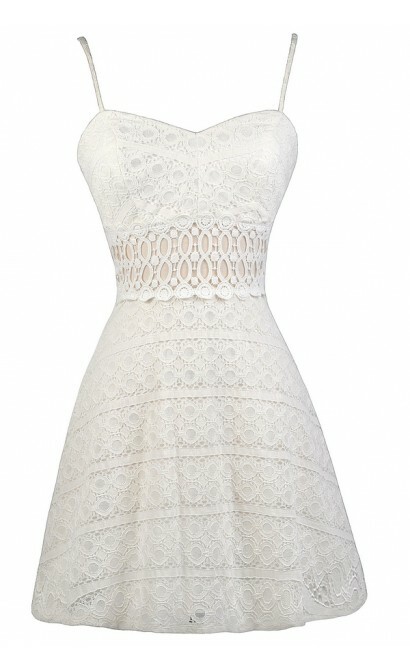 The Open Lace Flowy Dress looks perfect paired with beige wedges or heels. It could also be worn with cowboy boots for a cute country look. Details: Lined, except at waist. Adjustable spaghetti straps. Hidden back zipper. 80% cotton, 20% nylon. Lining: 100% polyester. Hand wash gently inside out, cold water. Do not rub. Do not bleach. Dry flat. Cool iron if needed. Dry clean. Size 3 measurements: Length from top of bust to hemline: 28". Bust: 32". You have added Open Lace Flowy Dress in Ivory into Wishlist. 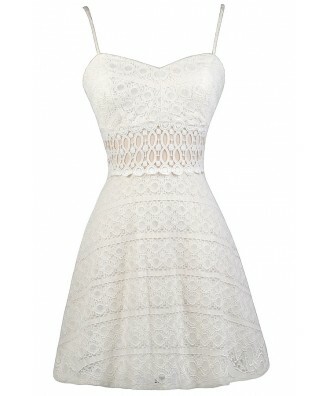 You have added Open Lace Flowy Dress in Ivory for Stock Notification. 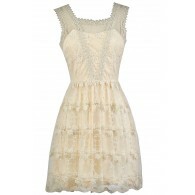 You have set Open Lace Flowy Dress in Ivory as a loved product. You have removed Open Lace Flowy Dress in Ivory as a loved product.